Open support features additional neoprene around the knee. 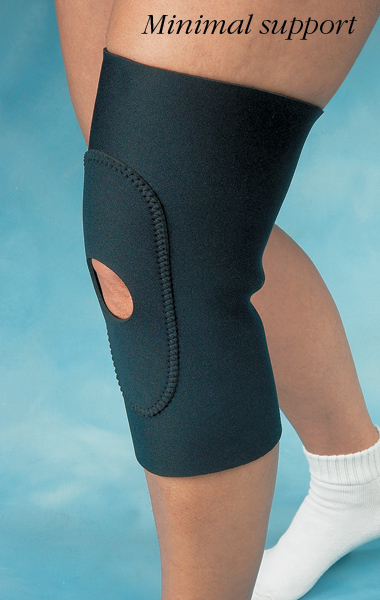 The Comfortprene™ Deluxe Knee Support w/Open Patella is made of 1/8" (3.2mm) neoprene with a nylon liner. Proximal end tapers in back for a comfortable fit. 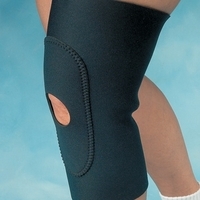 Additional neoprene layer surrounds the anterior knee to provide extra warmth and padding. Support measures 12-1/2" (32cm) long. Hand wash and air dry. To size, measure circumference at the knee. If between sizes, order the smaller size.